It is finally Friday! The start to the weekend! A time where parents want to relax and spend some time with their families! We are a huge movie family and love doing family movie nights (and sometimes, lunches! ), so I am excited to introduce this new series to you! Each week From ABCs to ACTs, Mommy In Sports, Minutes of Motherhood, Gym.Craft.Laundry and myself will be posting fun activities, recipes, printables and more to go along with movies that we have watched with our families! This week, we watched Disney’s Alice In Wonderland, because we had just finished reading the book in our homeschool! In honor of Alice’s world of nonsense, I made a lunch of utter nonsense! A lunch of utter nonsense is quite easy to make, but remember, you can always change up the ingredients and make it your own! This lunch of utter nonsense included Peanut Butter & Pudding Sandwiches and Sour Grapes! To make the PB&P, I used vanilla pudding and natural creamy peanut butter spread onto some cracked wheat bread, which is surprisingly DELICIOUS! To make the sour grapes, simply toss freshly washed grapes in some kool-aid powder! Viola! 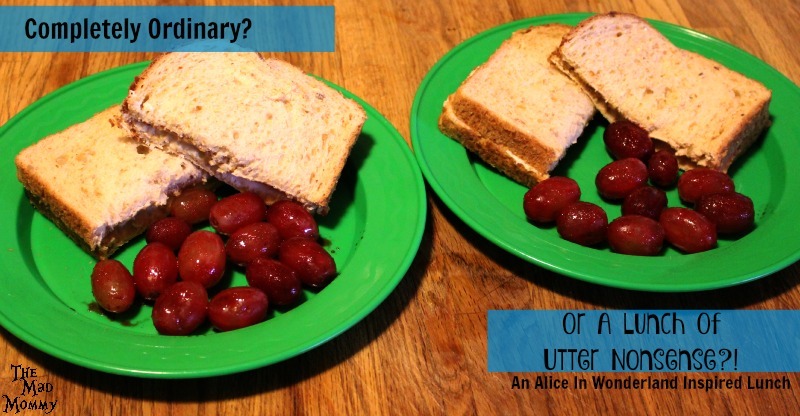 It’s as simple as that to create an Alice In Wonderland inspired lunch filled with utter nonsense! Make family movie nights more fun by including things like this Alice In Wonderland inspired lunch! Do you enjoy movie nights with your family? This is awesome! I never would have thought of putting those two together but I guess that’s what makes it utter nonsense 🙂 LOVE it! Perfectly extraordinary! I love it. I can almost taste it and it works. Scarlet would like vanilla pudding with her peanut butter. We were talking about the new Alice movie coming out in 2016 today. I’ve never heard of this before. My kids would probably love vanilla pudding with peanut butter. Enjoy the rest of your weekend. I love this idea!!! And who doesn’t love sour and sweet together! The lunch looks really good! 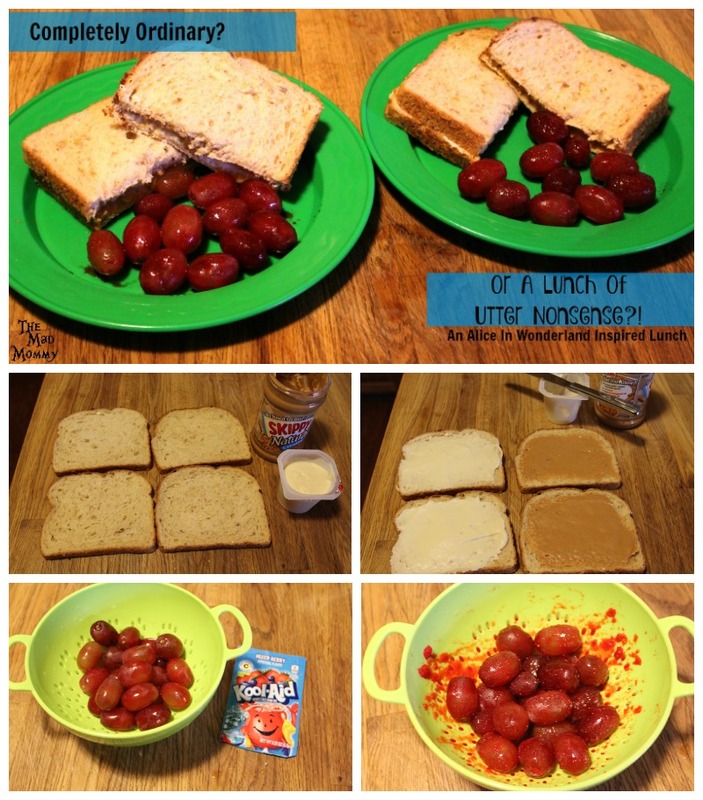 What a fun link- up and yes, my kids would be fans of your utter nonsense meal! so creative! I totally wouldn’t have thought to do that! !